OMG! The NRA ATTACKED the President’s Daughters!!! Grab the smelling salts… the NRA mentioned the president’s daughters. Not by name, mind you, just said his kids had armed security at their school but the president thinks OURS need a gun free zone. Wow, the FIENDS. Saying his daughters have armed protection crosses an inviolable line… it’s hatemongerin donchaknow! Yeah, obviously the NRA should never mention the president’s kids have armed protection. … saying NRA headquarters is full of “hate mongers” and “crazy people”. For starters, that’s bold talk for a guy who will forever be known as the front-runner for his party’s presidential nomination… until he delivered a spit spewing rant that caused his own party to openly question his mental stability and drop him like a hot potato. If I were Howard, I wouldn’t bring up “crazy” a lot. The clip below shows both the advertisement and the visceral revulsion the left feels about this obviously scurrilous mention that the president’s kids have the benefit of armed guards. But even if the statement were made by someone that didn’t have a history of looking like a prime candidate for Prozac, it totally fails to address the real question. The ad is not about the presidents daughters, and in no way disparages them. The ad is about the presidents hypocrisy in claiming armed guards are a danger to our children but a safety factor for his. 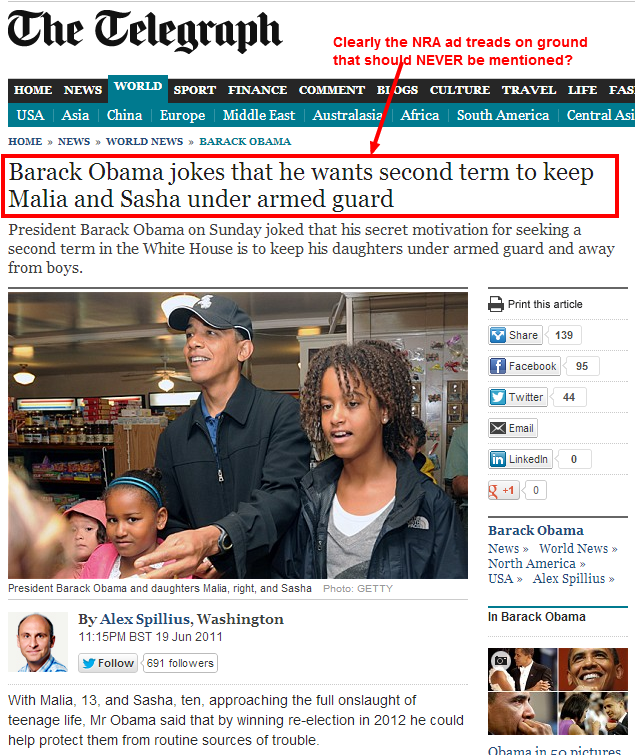 The president even mentioned one of the benefits of a second term was that his daughters continued to get armed protection. [SEE ARTICLE] So let’s drop the pretense the NRA ad was an attack on his children. It attacked his position, nothing more. How ’bout answering instead of posturing? Instead of deflecting from the point by hitting the fainting couch about the hateful ATTACK on the presidents children (which never happened)… how about dropping the faux outrage and answer the damned question. Why DO armed guards make his kids safer but would endanger ours? Simple question. How? Every mass shooting but one since the creation of gun-free-zones happened in a gun-free-zone. Let’s address that with measures that are proven to work. We protect our money with armed guards. We protect the children of the rich and famous with armed guards. Why then is it a silly and reckless idea when it comes to protecting our kids? Seems like I remember the Liberals skewering Bristol Palin without all the accompanying outrage from the MSM. Just more liberal hypocrisy that gets overlooked. Yep, and that was ok… Even though those remarks were in fact highly personal and were not virtually identical to remarks Sarah Palin had made herself. Odd that that was ok but this is evil.